When a ketone is treated with a Grignard reagent, a new carbon-carbon bond is formed at the carbonyl carbon. Subsequent addition of water (acid) will give the tertiary alcohol. This addition to ketones is also a reduction, but it involves the introduction of an alkyl group. This can be achieved by an organometallic compound which is also called Grignard reagent. This reagent is formed by the reaction between an alkyl halide and magnesium which is presented by the general formula RMgX. Grignard reagents are rarely isolated. They are formed in solution and used immediately in the reaction. These reagents are sensitive to air and moisture so they cannot be present together in a reaction flask. In the presence of water, Grignard reagents will hydrolyze to give metallic hydroxide and alkane. Only after the Grignard reagent has attacked the ketone, then water can be added to protonate the alkoxide. 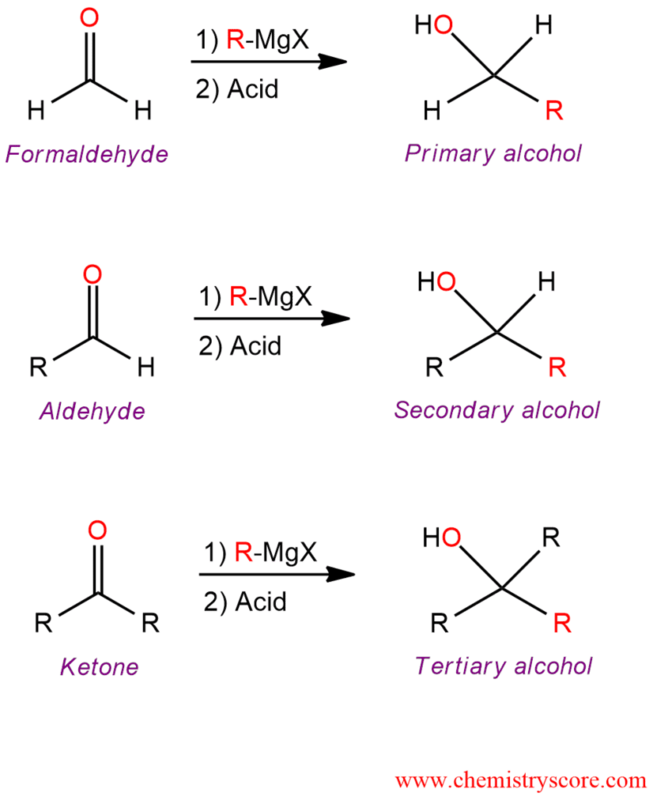 Addition of Grignard reagent to carbonyl compound is used to prepare primary, secondary, and tertiary alcohols, depending on the number of alkyl groups bonded to the carbonyl carbon of aldehyde or ketone.